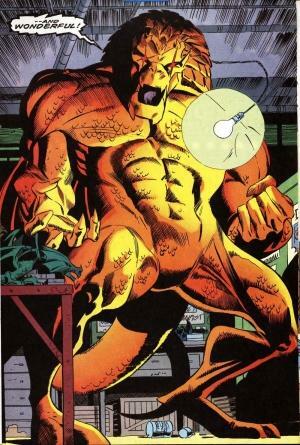 Powers: The Dragon King possesses an unknown degree of superhuman strength (at least Class 5) and resistance to injury. He can shoot bolts of energy from his eyes, and can utilize his prehensile tail as a weapon. History: (Spider-Girl#4)-Carlton Hackmutter was a janitor at Midtown High School for many years, a dreamer who aspired to one day be a hero like his idols Captain America, Conan and Captain Kirk. As time wore on he gave up his dreams and grew to resent both the job and the students. The only reason he kept working was to have enough money for his one hobby, collecting antiques bearing the images of dragons. He kept these objects safely stored in his janitor's closet, and his most prized piece was a dragon medallion from China that reportedly possessed mystical properties. Hackmutter's latest problem was the constant fights between Midtown bully Moose and honor student Jimmy Yama. After one such fight in the cafeteria Hackmutter lost his temper while cleaning up, and cut himself on some broken glass. Rushing back to the janitor's closet he bandaged up his hand and accidentally dripped blood on his dragon medallion. This catalyst released the hidden powers of the medallion, transforming him into the Dragon King. He then went on a rampage through the school, all the time yelling at the students for having treated him like dirt. Spider-Girl appeared, and distracted the Dragon King's attention from the students. 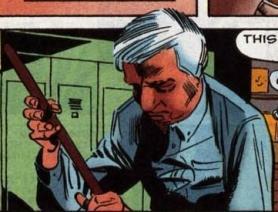 They fought until Spider-Girl lured him back to the janitor's closet. She threatened to destroy his antique collection, causing the Dragon King to heedlessly charge her. He ran right into the electrical main, shorting it out and knocking himself unconscious. He was then taken away in a police ambulance. 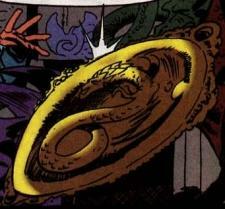 (Spider-Girl#25)-Funny Face recruited Dragon King as a member of the Savage Six. Dragon King saw it as a moneymaking enterprise, but still went along with the group when Funny Face announced their one goal was Spider-Girl's destruction. The Six kidnapped two Midtown students, Jack Jameson and Courtney Duran, baiting Spider-Girl to fight them in a series of predetermined locations. Dragon King chose a trainyard, and started the fight by lifting a five-ton boxcar above Spider-Girl's head. She used her webbing to throw off the Dragon King's grip, causing the boxcar to land directly on his head. (Spider-Girl#80 (fb)-BTS) - A student named Kevin Hartman found the Dragon Medallion, but upon befriending Dragon King, hid it. Hartman intended to use his new ally to strike out at the bullies that harassed him. (Spider-Girl#80) - Spider-Girl arrived at a burglary at an antiques store, only to encounter Dragon King, who was searching for his missing medallion. The two fought briefly before he escaped. Returning to the school, Dragon King then attacked the two bullies who had tormented Hartman. Spider-Girl, in her regular identity of student May Parker, took notice of Hartman acting odd, and followed him to the school's basement. There, she confronted the two, but managed to figure out that Hartman was purposely hiding the medallion. When she revealed to Dragon King that the student actually had the item, the monster used it to return himself to human form. After that, Hackmutter surrendered to the authorities, who also took Hartman in. Comments: Created by Tom DeFalco, Pat Olliffe and Al Williamson. Any other characters named "Dragon" or "King"
Mystic artifact from China, capable of transforming it's owner into a half-human, half-dragon monster when blood has been spilled on it. This transformation is apparently permanent.